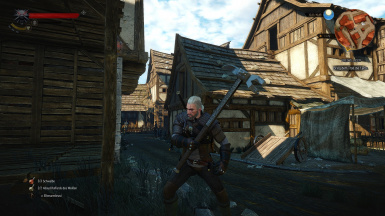 Redefines all relic blades from scratch to be useful/gives you access to NPC only weapons/let you upgrade all relic blades,DLC and Kaer Morhen Armor,DLC and Witcher Crossbows,Viper and Vesemir Swords/adds dozens of new loot into the world/modifies some Vendors/adds many quest rewards/heightens Gwent bet to 50/adds new animations/effects etc. 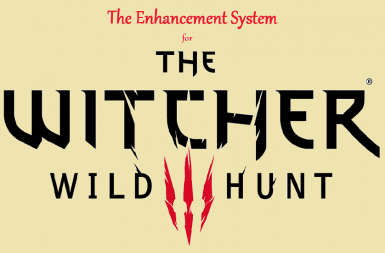 The Enhancement System (Russian translate) Чтобы использовать мой файл, требуется этот мод. 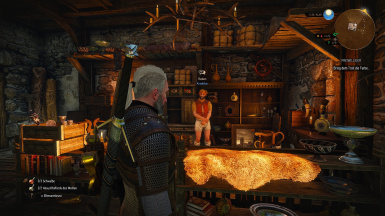 -Witcher 3 Books of Advanced Witcher Books Collection: http://www.nexusmods.com/witcher3/mods/1265/? 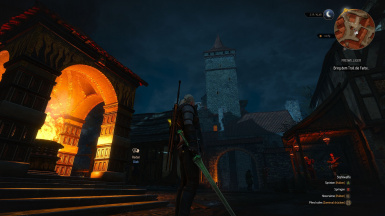 -Mod translated into Spanish,Czech,Italian,Russian,Polish,France,Portugese/Brazilian,German,Arabic,Korean - You DONT need Custom Localization Fix anymore or change scripts.Mod runs on its own. 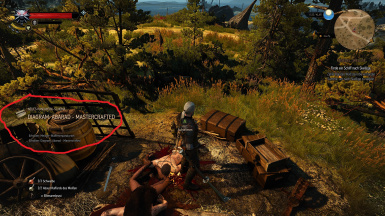 -adjusted the general loot drop rate,that you aren`t spammed anymore with my items - now they are really treasures! 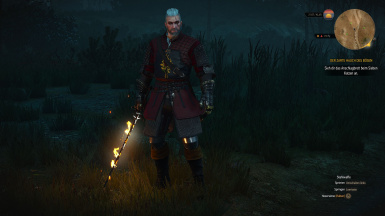 -Son of Sparda Swords = http://www.nexusmods.com/witcher3/mods/1097/? 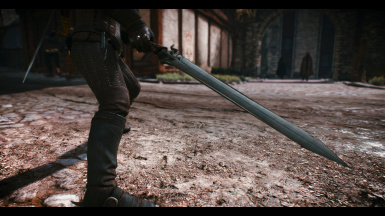 -Valyrian Steelsword of Jon Snow = http://www.nexusmods.com/witcher3/mods/1166/? 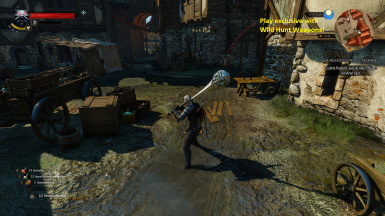 -Witcher 2 Weapons = http://www.nexusmods.com/witcher3/mods/1255/? 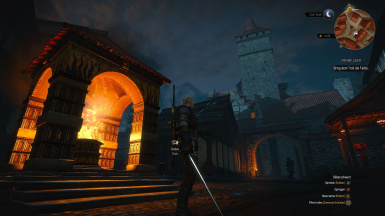 -Dark Weapons Witcher 2 - Modders Ressource = http://www.nexusmods.com/witcher3/mods/1200/? 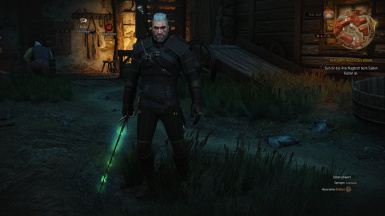 -Icons and Scabbard for Dark Weapons = http://www.nexusmods.com/witcher3/mods/1249/? 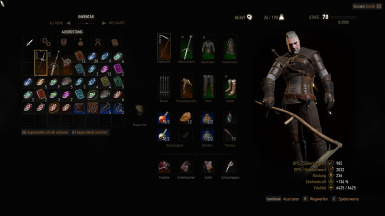 -Better Crafting Menu = http://www.nexusmods.com/witcher3/mods/1037/? 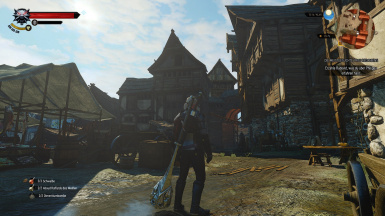 -Show Real Value = http://www.nexusmods.com/witcher3/mods/1201/? -Update of Crossbow Damage Boost and Balance = http://www.nexusmods.com/witcher3/mods/1126/? 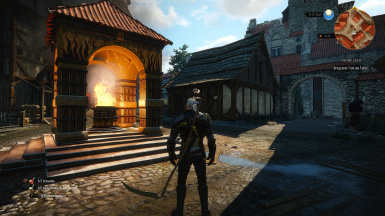 -Animations from Eating and Drinking animations partially added = http://www.nexusmods.com/witcher3/mods/1040/? 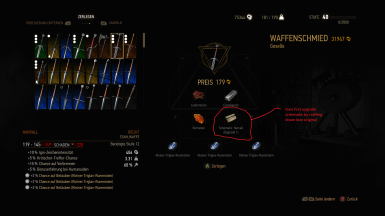 -Integrated new Feature: Money (Crowns) have carry weight,can be accessed in the inventory and can be stored in players chest. 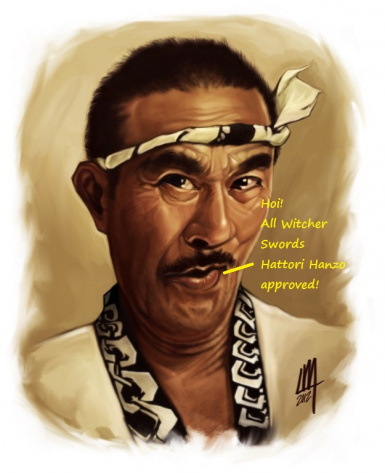 -Changed vendors: Hattori sells now all relic weapons(on a specific level,to prevent buying before getting weapon by quest),Yoana sells kaer morhen armor,and Loan Shark Pawn Shop sells all schematics(on a specific level,to prevent buying before getting schematic by quest). 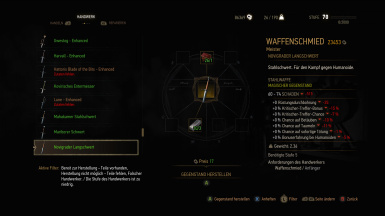 Kaer Trolde Vendor is gone. 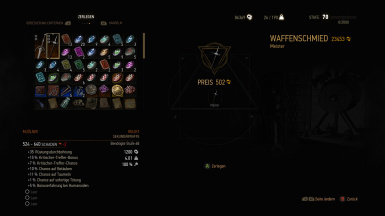 -Took buyable witcher gear treasure maps away from Vendors,you can just buy wolf gear maps.Everything else are gwent rewards now,from special opponents you can match on the witcher gears required level. 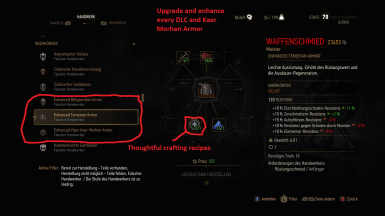 -Integrated first starting Armor.Kaer Morhen armor has now 4 upgrades. 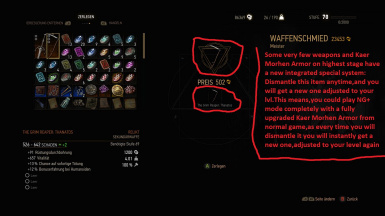 Fixed New Game + schematics,as they needed normal game before upgraded weapon on highest Upgrade.This was a big bug which caused extremely upgrading problematics. 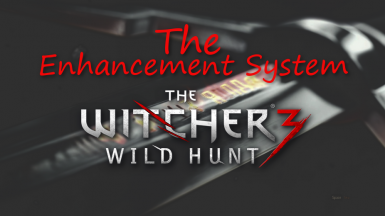 The Enhancement System is created to enhance the RPG feeling of the game by adding more depth,functions and possibilities into many aspects of the game.It started as simple weapon upgrade mod,and became what it is now: a huge Overhaul for The Witcher 3.Many mods you may know were integrated in TES,to deliver the best possible experience for you. Further informations you`ll find in different sections below. 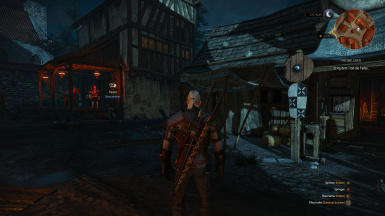 I recommend to remove the questionmarks from your map in the graphic hud menu to enhance the RPG feeling even further and make treasure finding truly rewarding. 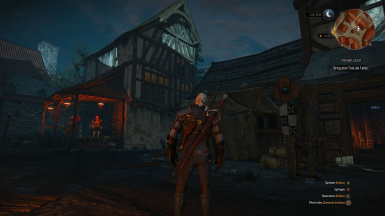 It is advised to start a new game to get the full experience out of the mod,but it will work on an existing save also. 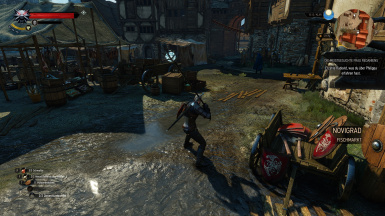 as your own, by buying and/or questing.With fixed and partially custom animations! Eredins Blade will no longer be taken from your hip and appear on your back. 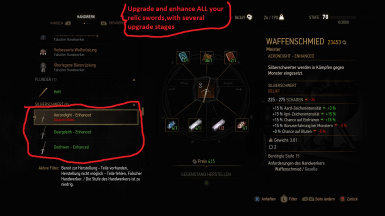 Redefines all relic weapons from scratch,to be useful and ready to upgrade.No relic weapon you know will have the same effects as before! Also completely re-worked from Relic Weapons Redone, hopefully not so OP. Upgrade your favorite Fraction Armor! 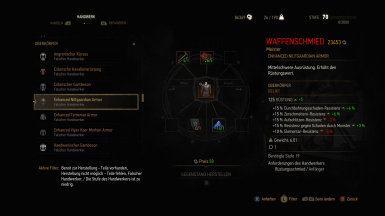 All 3 DLC Armors (Temerian,Nilfgaardian and Skellige) have been included into the crafting system. 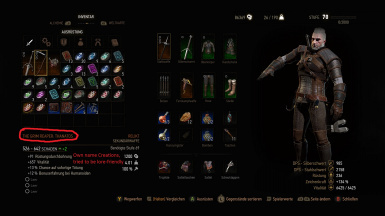 Now you aren`t limited to Witcher Gear anymore.You can just upgrade your favorite relic fraction armor,to keep up with Witcher Gear! 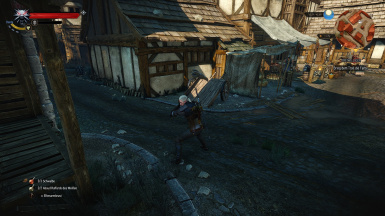 Some crossbows redefined for more usability,and also added to the upgrade system. 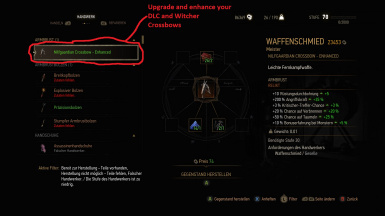 Now you can upgrade Skellige/Nilfgaard/Elven Crossbow as well as Lynx/Bear/Death from above Crossbow! 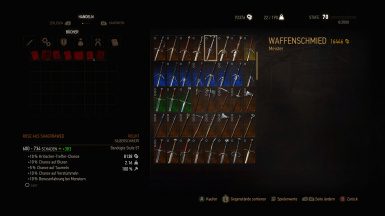 Relic Weapon Merchant added: The Hattori in Novigrad will sell you all loot originals of the relic swords - if you missed or want one. He is used as a base to upgrade. 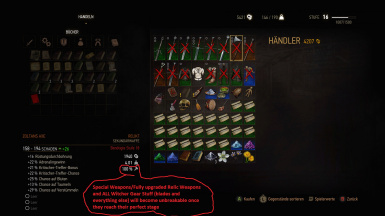 Unbreakable Relic and Witcher Swords,also all Witcher and DLC Gear on highest upgrade stage added - why calling it legendary stuff when it breaks all few minutes? 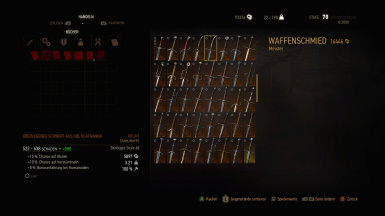 You`ll get most of the materials back from de-crafting. 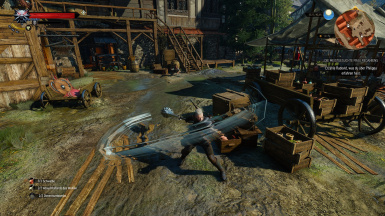 Adds throwable knives as secondary weapons to the game. 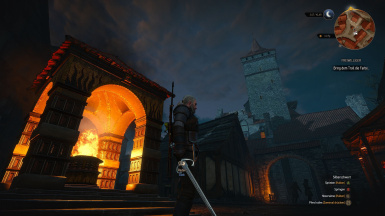 Sword effects added,you can always change them in the mod menu.I suggest when you use a sword which can burn people,you turn on the fire effect,when using a sword with stagger effect you turn on the yrden effect and so on.Of course you can use as many effects as you want @the same time - or even not. 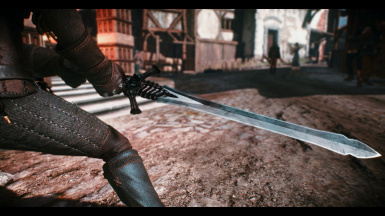 Adds some completely new weapons to the game,and retextures a few others to look more like in the previous games.I felt that this shouldn`t hurt anyone,as most blades in the game look alike either. 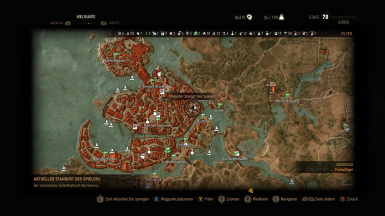 Treasure maps are now much more expensive and are only sold from the book merchant in Novigrad @ the Hierarch square.Vanilla ones were simply too cheap for that what they offer: the way to the most powerful items ingame.You can find them without treasure maps,or you pay a price worthy for what you get from it. 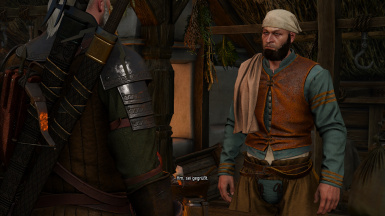 My other mod "The Gwent Card Dealer" is also integrated,as he doesn`t harm someone - otherwise there would be compatibility issues between my 2 mods - he is located in the tavern on the crossroads and will sell you Gwent cards you could otherwise only buy at merchants coming later in the story- it is useful as you otherwise play 95 % of your Gwent Card games with your Temerian Deck...am I right? 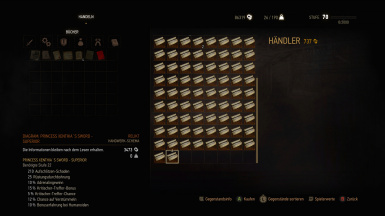 You will find more money in the world,but therefore I have given a small carry weight to it.Dont worry,you can access your money now and store it into your stash.Also I made it MUCH lighter than it was in the previous testversion,so it shouldn`t be a big burden anymore too soon. 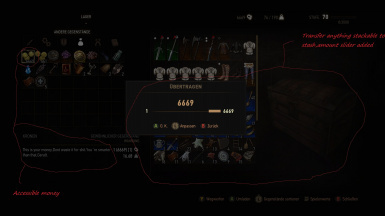 Now you can see the real value of an item before selling it for a too less price or buying it for a to high one.There was added a value amount slider for any stackable item in the players chest.Also the crafting menu was totally enhanced,now you see new craftables marked,the required level for it and you can filter the list through various options. 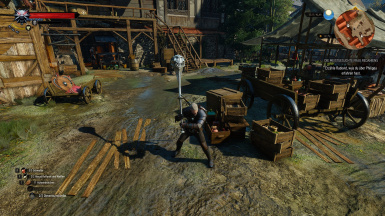 Taking different potions and applying oils to a drawn sword will now trigger an animation.Now you have to wait for the moment in battle where you can drink your potion! 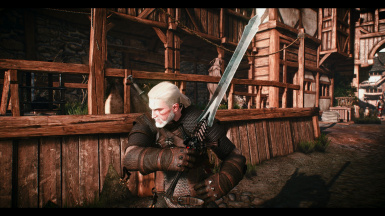 Makes things a lot more difficult but more immersive as well,and counteracts the fact that some weapons are stronger now than the vanilla game offered on purpose. 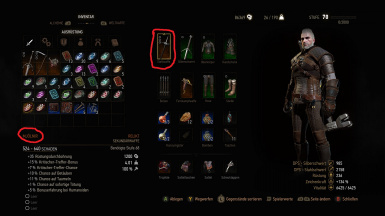 You will find more herbs now when looting a plant.Also you will get more quest rewards,many of them books,notes,weapons,armors or diagrams.The books and notes are cut content. 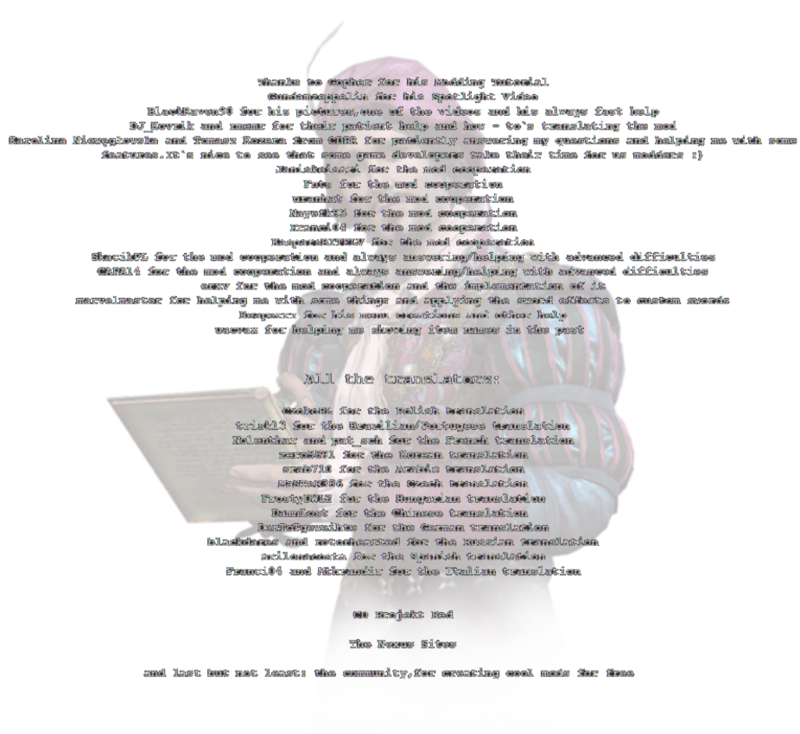 This mod was translated into nearly every language and can be used without Custom Localization Fix now. There are just missing the Japanese translation and translations for the HoS add-on. 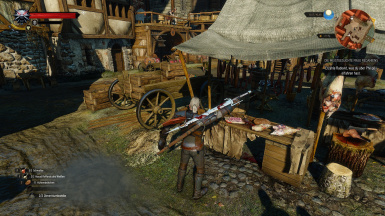 The HoS add-on makes many items of the HoS DLC much earlier available for the main game.You can buy them from Yoana in Crow`s Perch as soon as you meet her.Also it makes all those items upgradable and redefines them for a better use. 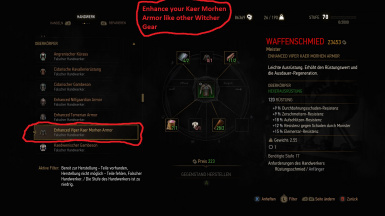 There will be no optional TES version for a medium Kaer Morhen Armor anymore,as the Viper armor from HoS serves for that use now. More informations about it you can find one topic below. 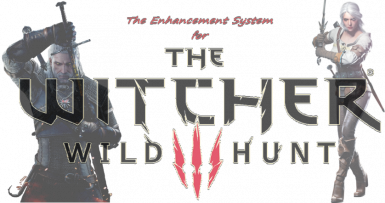 Contains every integrated mod and every feature,so be sure that you remove them all from your modfolder,if you were using them previously.With TES 2.5 there is no need anymore to use them as seperate mods. The HoS add-on is already integrated here,but it is on you if you want to install it. 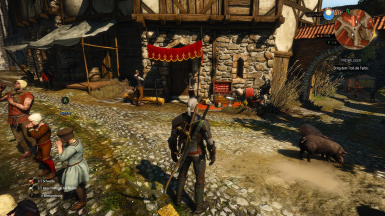 You can buy all of this items from Yoana in Crow`s Perch @ any time. Those items are upgraded by dismantling them,but beware,as always the upgrades will require a new level. 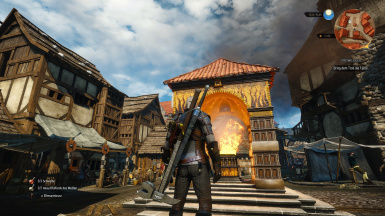 Please accept that the mod can`t be installed via NMM.This is simply because of it`s complexity,but it also ensures that the mod will running properly.NMM brought trouble installing Witcher mods in the past more than once. Remove all files of the previous version and replace them with the new one.Also remember to delete your old merges and refreshing them. Safedevelop - from Chickenudoom.Basically it cleans your whole savegame from scripts which were left behind.It does the same as the "cleardevelop" command you can enter in Debug Console,by drinking a Clearing Potion BUT let you stay on your level and doesn`t remove anything from your inventory like the Debug console command does. 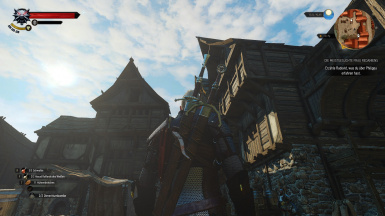 You can remove this mod again after using it once,but you should remember that it can solve many of your problems you might have with other mods in your future.I usually remove this mod from my mods after using it once,and when I get a new problem with a mod I use it once again. 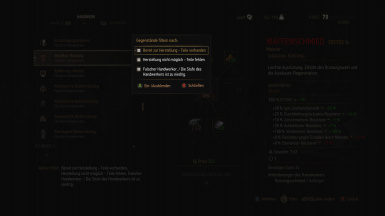 Enhanced Menus - from Janiskeisari.Does what it says. Show Real Value - from uranhat.Implements a nice little feature that you can see the real price of an item before selling or buying it.This could prevent you from selling an item for too less money or paying to much. 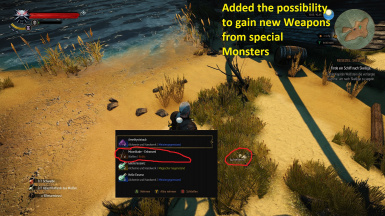 Better Crafting Menu - from uranhat.Adds filters to the crafting menu,shows new craftables and required levels. 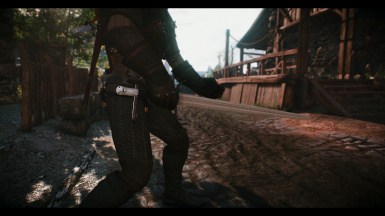 Throwing knife - from SkacikPL.Adds a new secondary weapon to the game,that you can use just like bombs. 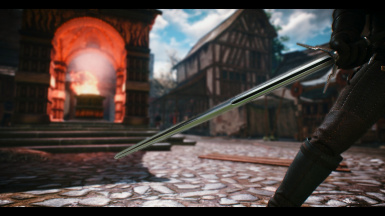 The Throwing knives have arrived in the Northern kingdoms. Crossbow Damage Boost and Balance - from Fnts.Does what it says. Sword effects of AMM - from CAPA14.Adds the very cool sword effects from AMM into TES.To ensure compatibility between AMM and TES you can find a optional version of TES without those effects built in. I have modified all those weapons,so that they don`t replace anything.Also they can be upgraded like everything else I`ve modified. 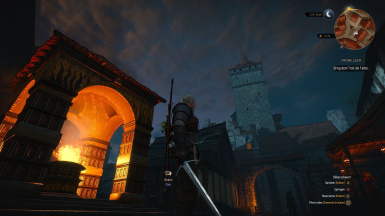 This integrated mods will replace a few swords and icons,to look more like in the previous Witcher games. 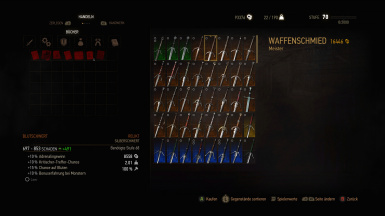 I also felt that it would bring more diversity to the look of the swords,as many swords in Witcher 3 look nearly the same. 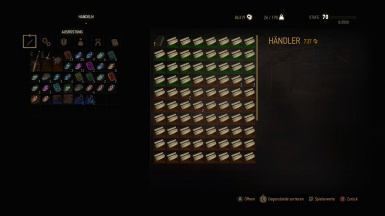 Advanced Witcher Book Collection - from KasparsBITELV.For now just the Witcher 3 books and notes,which CDPR had decided to remove from the game.They were added as quest rewards and can be bought from Novigrad Book Shop. 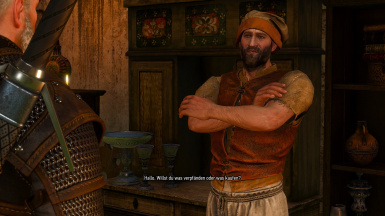 Enhanced Herbalism - from KasparsBITELV.Have you ever thought that it is strange that Geralt needs dozens of plants for his potions,but he always picks just one from a plant? 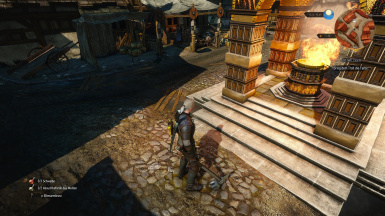 Well,this mod fixes that.Now Geralt can pick more pieces from a plant than just one. 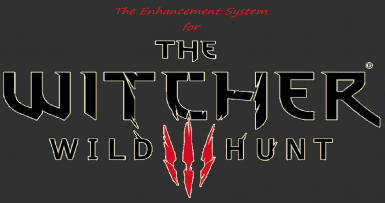 If you like The Enhancement System with all its features,please show it to all integrated mods and authors.Thank you. 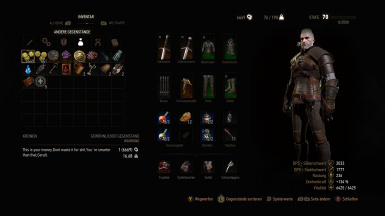 IMPORTANT: IF YOU USE THE FULL VERSIONS OF TES,YOU HAVE TO DELETE ALL THOSE MODS LISTED ABOVE FROM YOUR MODFOLDER! 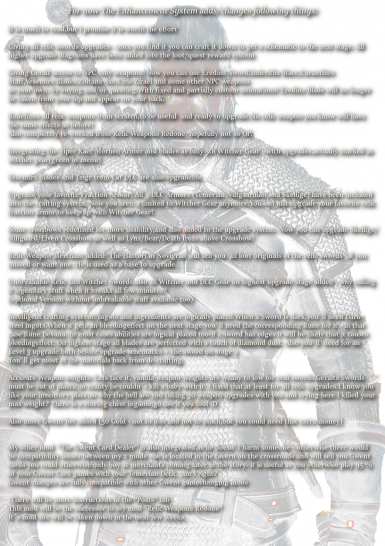 Lore-friendly Silver Swords - from ErdnussSpass.Use "SilverShines".Gives silver swords a nice silver touch. 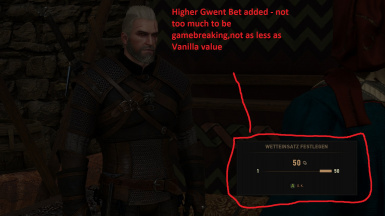 Slots Slots SLOTS - from Zur13 together with Set Skill Points Per Level - from pMark.With those mods in combination you can fully max out Geralt.Who doesn`t want an allrounder?I suggest to use this only on the highest difficulty setting.You could become a God. Mutagen Dissolution - from Tenzian.He made it possible to craft mutagens out of your monster mutagens. Really useful for getting red mutagens. Semi-auto and Double barreled Crossbow - from curme.I use the "Four barelled" version.Makes it possible to shoot 4 times before reloading. 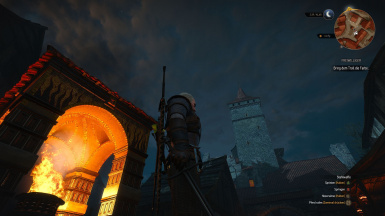 Enemy level scaling - from Marnah93 and Philozoraptor.I suggest using either the "Enemy lvls scale with your lvl" or "Scaling with extra challenge" version,if you wanna play a little bit with your foes and new weapons.Completely compatible. 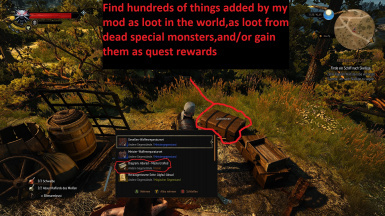 The Daily Monster Hunt Challenge - from Smalldjo.Adds a monster hunt to the Quest noticeboards every day. Each Item can be spawned via debug console.The codes need the inverted commas in the brackets,or they wont work. This list just contains my new added items.Also,it focuses on the items themselves,not the diagrams to craft them. The list would simply become too long. 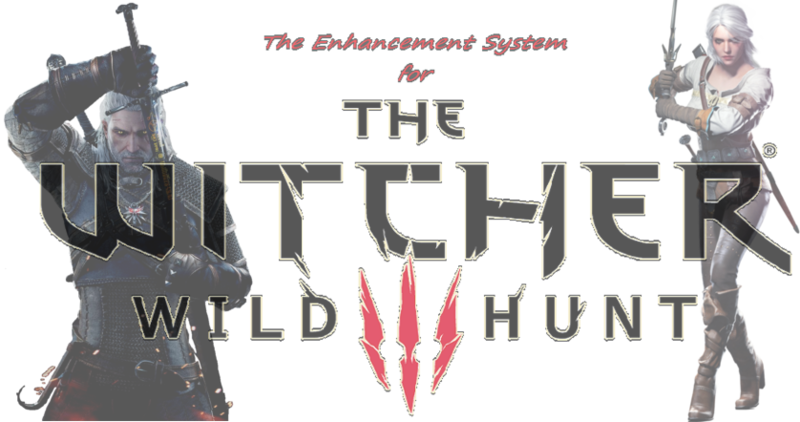 Also If you like The Enhancement System with all its features,please show it to all integrated mods and authors.I can not say this enough.I myself have to thank all mod authors of the integrated mods on this point too.Without you,TES wouldn`t have become what it is now!